We fell in love this weekend – over and over again. We fell in love with Puerto Vallarta, Mexico. It’s a vibrant, beautiful place filled with friendly people, a vibrant energy and amazing scenery. 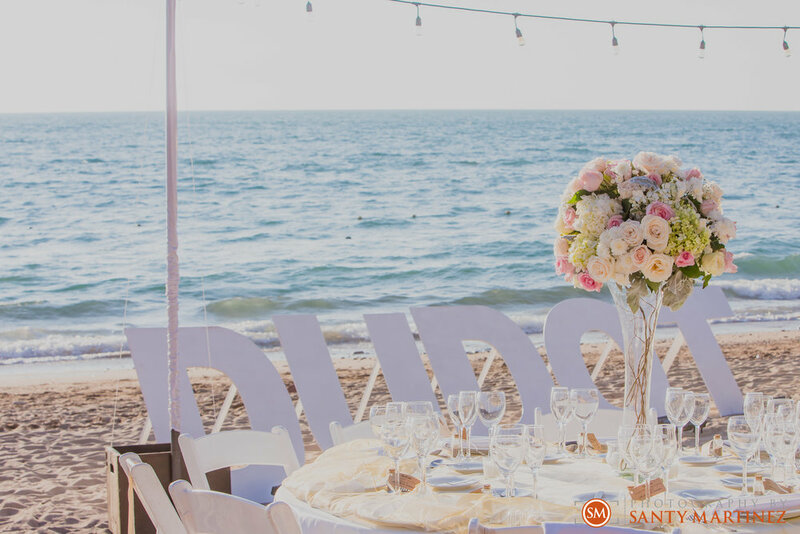 With its golden beaches situated alongside the Pacific Ocean and majestic mountainscape, Puerto Vallarta served as the perfect backdrop for a destination wedding. We fell in love with the resort. 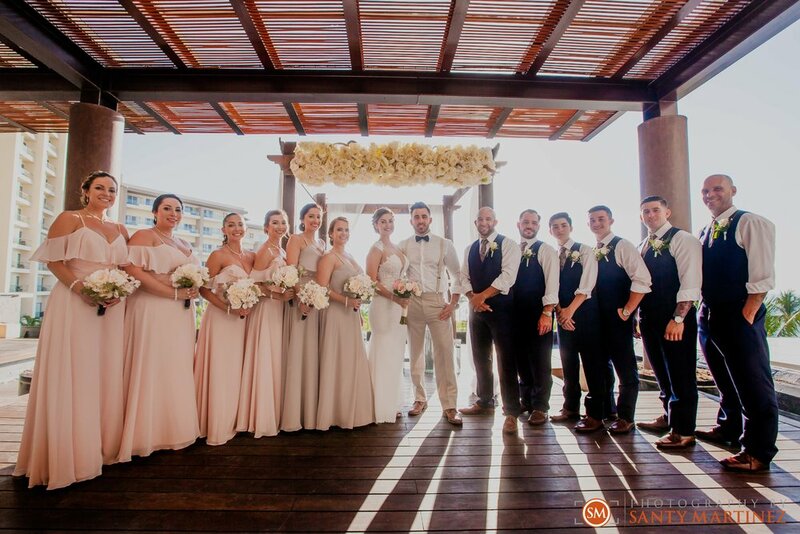 The bride and groom stayed alongside their guests at the spectacular Secrets Vallarta Bay where they were pampered from start to finish. From hanging out at one of its many sparkling pools to relaxing at their world class spa. This all-inclusive resort offered their guests unlimited spirits and gourmet dining. They could not have picked a more perfect location for their wedding day. We fell in love with Genni and Chris. From the moment we met this couple we were excited to shoot their wedding story. These two exude love and we were happy to first capture it during their engagement session. 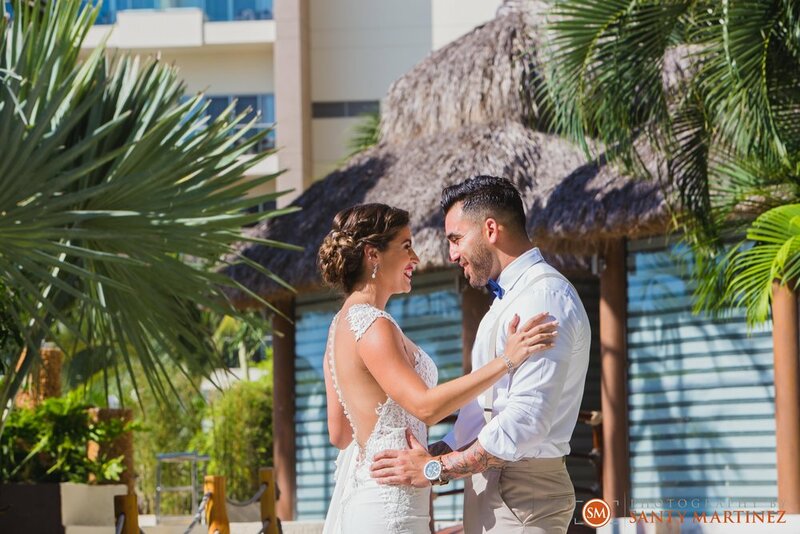 We love this couple so much that we traveled across the sea to shoot their big day! Genni and Chris have a zest for life that is contagious. We know we are not the only ones that think they are great. They traveled with a whole crew of their friends and family that know how terrific these two are. We fell in love with their wedding. This wedding was a dream come true. They made it official overlooking the Pacific Ocean as their guests witnessed the exchange of vows. The ceremony was sweet and romantic. 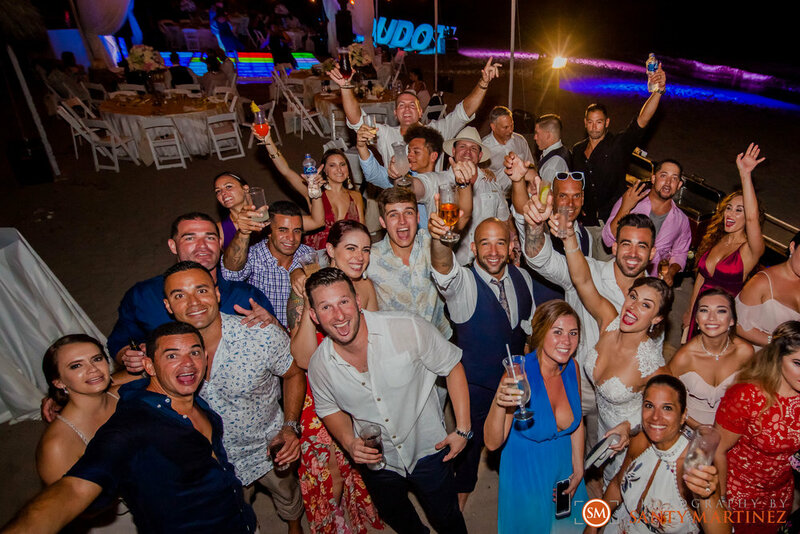 Once the “I do’s” were official – the party was ready to begin right on the beach! 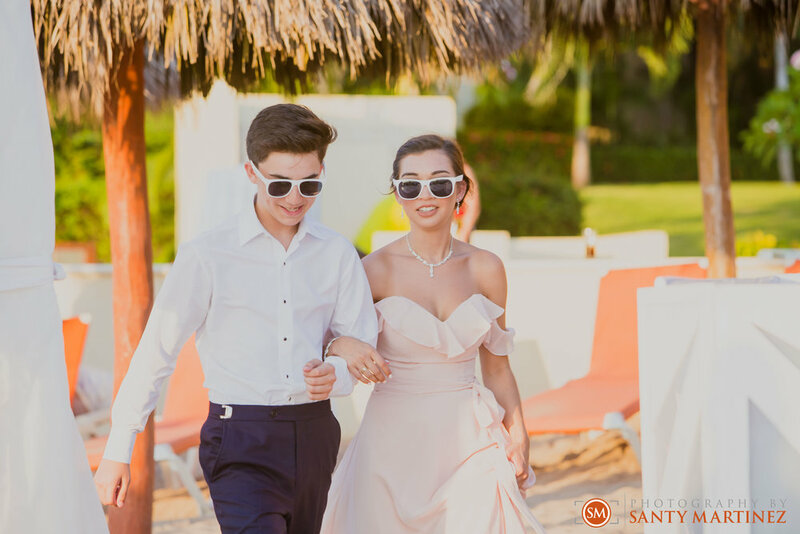 Guests had no issue sinking their toes in the sand. Sparks were literally flying as the two danced their first dance as husband and wife on the dance floor! After dinner and toasts – dancing ensued and did not stop until the end of the evening. 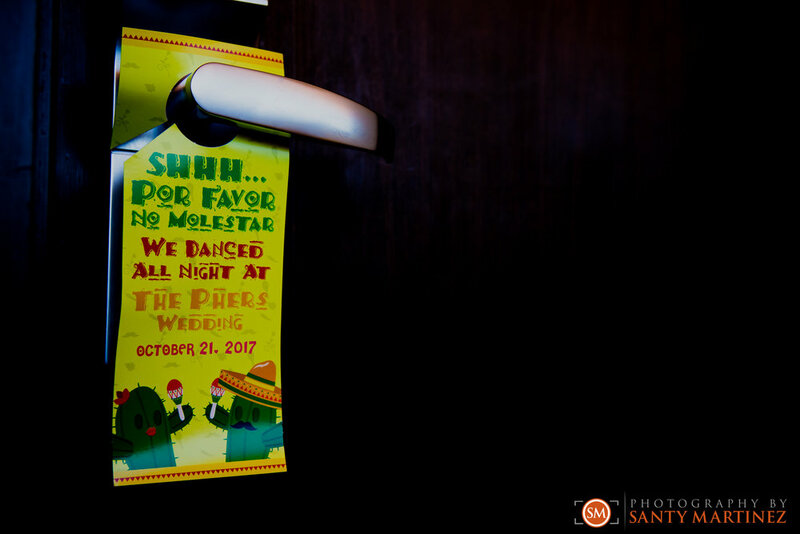 Which by now, if you have been following the love story along, you would know that the end of the night would not be complete without a grand exit! 70+ people on the beach with sparklers surrounded the beautiful couple as they watched an impressive firework display burst into the starry night sky. It was a perfect ending to a perfect wedding day. Can you see why we were in love? Finally, we fell in love once more with our photography business. We were reminded this weekend why we do what we do. Yes, we love photography and the art that we produce. But the real reason we love being wedding photographers is because we love the happiness we can preserve for our clients. We know that the photos we take today will outlive us one day and will be enjoyed by generations to come. This is a wonderful feeling! This weekend was nothing short of amazing and we were able to capture it for Genni and Chris. So we fell in love this weekend – now you all know! If you would like more information on our services, we would love to hear from you by filling out our contact form. Please enjoy the following highlights from this beautiful wedding and join us in congratulating Genni and Chris.